CrowdFund investing (aka equity-based Crowdfunding) is about to become the law of the land. Opponents have spent months screaming about how it would be an open invitation for investment fraud and a menace to small investors if it passed. Now that it has passed, it’s time to set those fears to rest. Crowdfunding will become a great source of funding for entrepreneurs and fully transparent way for investors to get in on the ground floor of what will be the greatest businesses of the future. Every entrepreneur, at one time or another, has felt the pinch of the capital markets. Inspired by the success of donation-based crowdfunding, social media as marketing tool, and the principles of seed financing, the three of us—Jason Best, Sherwood Neiss and Zak Cassady-Dorion—decided to create a solution. The result is a framework that allows an entrepreneur to raise a limited amount of capital from his friends, family and customers on SEC-registered websites with prudent investor protections. 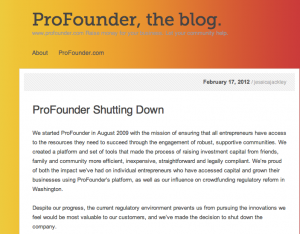 Why is CrowdFund Investing so necessary? With the collapse of the markets in 2008, the traditional means of financing startups and small businesses—credit cards, home equity lines, bank loans and venture capital—disappeared.Banks stopped lending and venture capital shifted away from seed stage investments to larger, more secure deals. 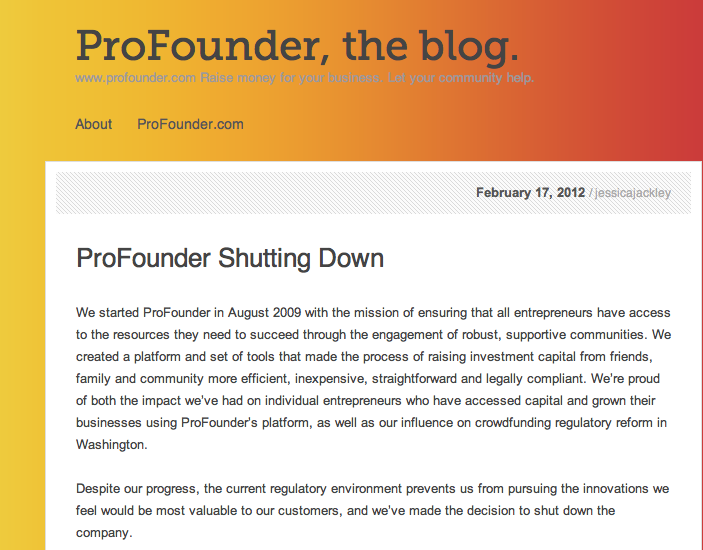 What was left was a funding void for businesses looking to raise $250,000 or less in seed or early-stage funding. According to the SBA, this round is the most critical capital a young company can get. Lack of it is the #1 reason why startups fail in the first 5 years. We carefully crafted our framework to protect investors, drawing on similar programs exempt from SEC rules. It is a rule under which entrepreneurs (who pass fraud/background checks) and small businesses with revenues of less than $5M (that aren’t foreign corps, public or investment companies) could raise up to $1M by either selling Common Stock or using revenue based financing on SEC-registered websites. Investors would have to pass a quiz proving that they understand there is no guarantee of return, that they could lose their entire investment and that their liquidity/return is limited to any dividends, sale, public offering or a merger of the company. Once they understood that, the amount they could invest (i.e., risk) would be limited—between $2,000 and $10,000, depending on their income. Standardized forms (generic term sheets & subscription agreements) based on industry best practices would be used to maintain transparency and reduce time and expense for all parties. Post-funding, standardized and automated reporting for use of proceeds would be required on a quarterly basis by entrepreneurs so people would know what is going on. All of this would be overseen by a Self Regulatory Organization (SRO) that reports to the SEC on what is taking place on CrowdFund Intermediaries with the goal to protect investors. Platforms would provide the SEC real-time offering reports that include information on: deals funded, entrepreneurs’ names, social security numbers, addresses, date of births, amount of capital raised, list of investors and individual dollar amount contributed. This way regulators would know who is crowdfunding, who is backing them and how much they’ve raised. And most importantly social media would control the process. Entrepreneurs would only be allowed to solicit people in their social network using Facebook, Twitter, Linkedin, etc. Platforms would use social media tools to create a deal room for each idea where interested investors can publicly pick apart the entrepreneur, the idea, the business model and the investment opportunity. And most important, no money would be exchanged until the entire crowd decided to fund the entrepreneur and the entrepreneur’s funding target was 100% met. So if you say you need $50,000 to expand your business, you only receive the money when you have secured commitments for the entire $50,000. If implemented as designed, these protections would allay everyone’s concerns. Entrepreneurs would get the capital they need. Investors would get the disclosues they need to make informed decisions. Regulators would stay informed on what is happening in the capital markets. Think it can be gamed? Well consider this. You know those eBay ratings that guide your decision to send $1,000 across the country in exchange for a product? You are going to see similar ratings for both entrepreneurs and investors on CrowdFund Investing sites. Know those comment fields with the like buttons on Facebook? You are going to see those on the communication panel where interested investors will require answers of an entrepreneur and those answers will be rated and further discussed (just because that’s how we like to do things in an open dialog on the internet today). Now take any fraud example you can think of and run it through this scenario. How many con artists want to register with the SEC? How many want to target those closest to them? (That’s how crowdfunding through social media works: You are limited by soliciting your social media connections.) Yes, once the law is implemented a bad guy could cold-call an investor and claim to be crowdfunding the next Facebook. But that would be fraud, just as it is today, and the perpetrator could go to jail. The CrowdFund Investing framework restricts all communication to crowdunding intermediary sites, and in doing so provides the tools to protect investors. In 5 years, chances are the SEC will be using these tools to crack down on larger scale fraud. Now that the JOBS Act has passed, we are moving to the next phase of development on a two-track strategy. First we’ll help build a self-regulating organization, like Nasdaq, to be the voice of the Crowdfunding industry and work with the SEC to regulate funding platforms and keep investors educated. Second, we’ll work with the SEC on their rule-making progress. It is vitally important that entrepreneurs and small business people stay tuned in. The SEC will begin with 90 days of rulemaking, and then open their draft rules for 90 days of comments. These comments are very important to the process. Entrepeneurs have the most to gain (and lose) so we must continue to fight for rules that provide fair balance between the needs of investors and entrepreneurs. US House Approves Senate Version of Crowdfunding! Off to the President! US Senate Votes in FAVOR of Crowdfunding! 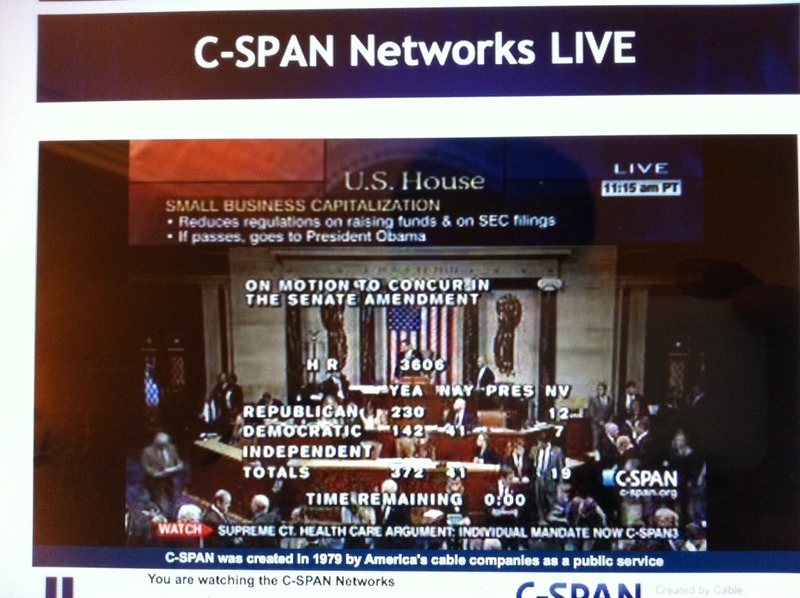 At 1:20pm Thursday, March 22, 2012 the US Senate voted in FAVOR of HR3606 the JOBS Act. CrowdFund Investing (CFI) to be LEGALIZED in the USA! 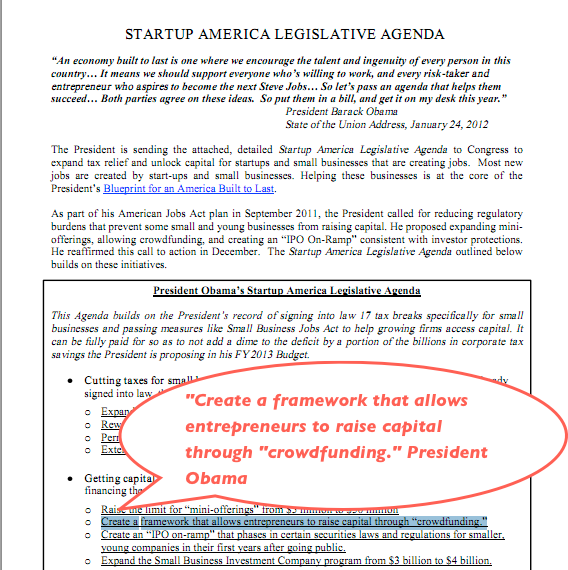 Because The Senate version of Crowdfunding was attached as an amendment. It needs to go back to the US House for one final vote!! BriefingWire.com, 2/24/2012 – Roswell, GA, Feb. 24, 2012 — Today the SoHo Loft announced the agenda for its upcoming Capital Creation and Crowdfunding Conference, the definitive forum for learning about the rapidly evolving marketplace for private company stock. The two-day event will be held in Los Angeles, CA on Tuesday, March 13th and Wednesday, March 14th. In this remarkable moment in history, the U.S. regulatory environment, its capital markets and the innovation that drives those markets are simultaneously on the threshold of dramatic change. We are currently witnessing the embryonic period of a cutting-edge stock market just as we usher in a new era of mass media. At the same time, new legislation aimed at facilitating capital formation is being introduced to support this modern infrastructure. There has never been a more opportunistic time to capitalize on change. TSL’s Capital Creation and Crowdfunding Conference provides attendees with key insight into the direction of the U.S. capital markets during this period of regulatory transformation and the rapid progression of the developing ecosystem. Attendees will get a fresh look at how capital formation is changing as well as learn where new growth opportunities exist, how social media is transforming Wall Street and most importantly, how to capitalize in this changing paradigm. Attendees will also get to know the players who are shaping the Private Company Marketplace (PCM) including the private shares desks and exchange platforms, crowdfunding experts, secondary private share buyers and angels, private stock analysts, legislators and seasoned entrepreneurs. There will also be ample networking sessions to exchange ideas, discourse and opportunities. 4. Steven A. Cinelli, Founder, CEO, PRIMARQ Inc. The Soho Loft Capital Creation (TSLCC) Event Series is the only global event platform where accredited investors; accomplished angels; microfinancing groups; CIOs of investors; select merchant and investment bankers; VCs; family offices; incubators; private equity firms; pre-IPO mutual funds; secondary stock buyers, sellers and equity analysts from across the world assemble in order to exchange ideas, discourse and opportunities that will help reshape the capital markets and stimulate economic growth. Our mission is to bring awareness and drive capital to the private company marketplace (PCM) as well as to help develop its infrastructure so that it can mature into a viable and functional institutional marketplace that facilitates capital formation, innovation, expansion and job creation. For additional information please visit us at http://thesoholoft.com and www.facebook.com/TheSohoLoftevents.